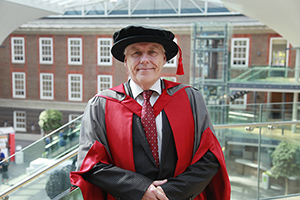 Brian Lamb OBE, a consultant who specialises in human rights, special educational needs (SEN) and disability issues, has been awarded an honorary degree by Middlesex University. Mr Lamb chaired a major Government inquiry, known as the Lamb Inquiry (2008-2010), into how parental confidence in the special educational needs system could be improved. Many of the recommendations he made were adopted by the Government and have been included in recent legislation. Mr Lamb held senior director roles at charities Action on Hearing Loss and Scope, where he was responsible for communications, campaigning, research, public policy and service projects. He led the award-winning Action on Hearing Loss campaign to reform audiology services and introduce digital hearing aids through the NHS; and was awarded a People Of The Year award by Human Rights organisation RADAR in 2005, for the promotion of disabled people's rights. Mr Lamb recently became the founding chair of Achievement for All, a new charity working to improve outcomes and raise attainment for children with SEN. Having won over £16 million in government contracts to roll out the improvements recommended in the Lamb Inquiry, the charity is now working in over 2,000 schools. On receiving his honorary degree, Mr Lamb said: "Graduation is a sign of investment in a young person's future. It's a great day for friends and families to see their achievements. "Whatever students go into they should always look towards what people can do, rather than what they can't. We are often too quick to write people off." Middlesex University Vice-Chancellor Professor Michael Driscoll said: "At Middlesex University we constantly strive to improve the experience of students regardless of their educational needs. "Brian Lamb OBE has been hugely influential in improving the educational system in this respect, and we are delighted to present him with this award."